Electronic Voting Machines (EVMs) will be used in all the constituencies. Perhaps it is then easier to rig the outcome. After all, in the 1999 general elections, the BJP and its allies won 34 out of the 45 Lok Sabha constituencies which had EVMs. On that ratio, the NDA should have won 405 se ats of the 544 Lok Sabha constituencies and not 292. EVMs have to be programmed by an engineer to tabulate the votes in its memory. It can easily be programmed to transfer votes of one candidate to another, or one party to another. The EVMs are entirely unsafeguarded today. I suspect it was rigged in the 1999 general elections. Independently in 2009, Dr Anupam Saraph, the chief information officer of Pune, appointed by the Pune Municipal Corporation and an advisor to the United Nations and Dr Madhav Nalapath, an expert on geopolitics, who had planned to track the elections found excel files on the Election Commission’s website on the 6th of May 2009 – 9 days before the polling ended on 15th May and 10 days before vote counting began. This data was further updated on the 8th and 11th before the final results. 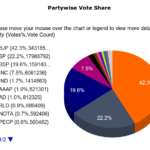 The Election Commission dismissed this finding as dummy data. However it is unlikely that dummy data would get updated or that dummy data would reflect trends accurately in 180 constituencies. More information, including the updated xls file versions here. In 2010, a trio of scientists; Hari K. Prasad, Rop Gonggrijp and J. Alex Halderman from the University of Michigan (United States) demonstrated how Indian Electronic Voting Machines can be hacked in several ways. 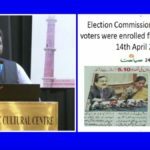 The video refutes several claims of security made by the Election Commission and is a must watch for every Indian voter. Also in 2010, we saw Narendra Modi and BJP accused of EVM rigging when it turned out that machines used to poll votes had not been supplied by the EC and there were reports of votes cast for the Congress resulting in the light for BJP being lit. After polling by 44 people, one machine registered 111 votes. This year’s Lok Sabha Election saw several allegations of EVM rigging, including a machine in Assam that transferred all votes to the BJP ound in random testing and two machines found during voting where the light for the Congress blinked, no matter what button was pressed, in Maharashtra. 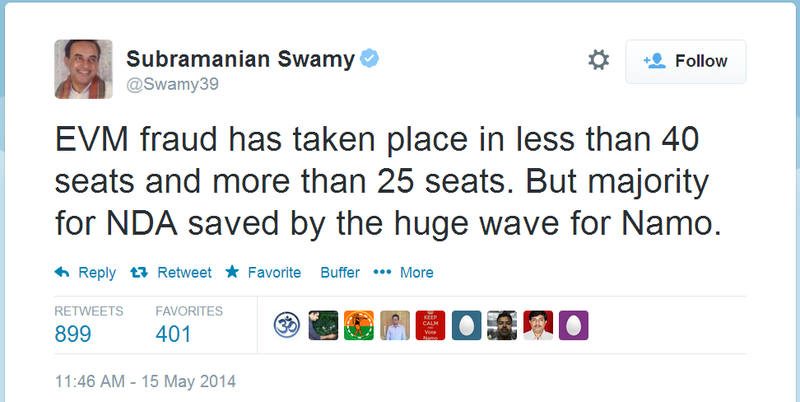 Subramanian Swamy had tweeted that several machines had been rigged. However, this is the tip o the iceberg. The video makes it clear that rigging is possible in ways that are less easily detectable – for example, transferring a certain percentage of the votes after a certain number of votes have been cast – so that it is more difficult to detect – there is virtually no trail. India’s Deputy Commissioner, Alok Shukla had told BBC, “It is not just the machine, but the overall administrative safeguards which we use that make it absolutely impossible for anybody to open the machine.” … “Before the elections take place, the machine is set in the presence of the candidates and their representatives. These people are allowed to put their seal on the machine, and nobody can open the machine without breaking the seals.” However, this is not true. The researchers state that the seals are easy to tamper with. But these are still possibilities. Less easy to dismiss are concrete incidents. 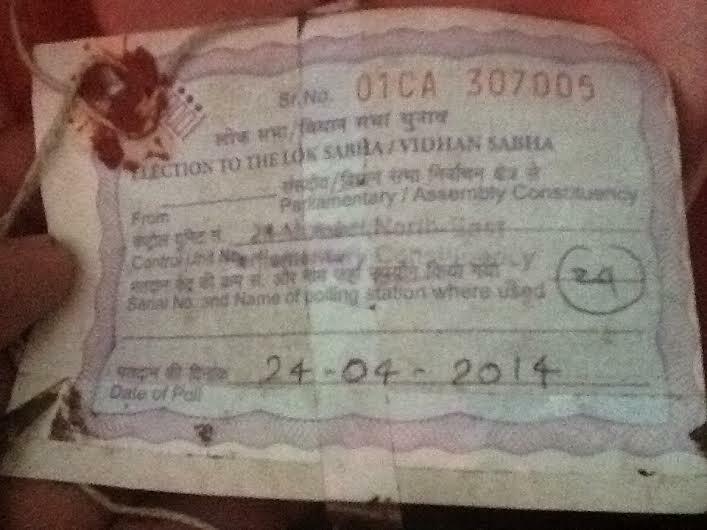 The address tag from the Electronic Voting Machine in Medha Patkar’s constituency was found on the street. The returning officer, in the case where the EVM was found transferring all votes to BJP said “These EVMs were here for long. Usually, EVMs are kept in the custody of the deputy commissioner and during elections they are taken to strong rooms.” Congress candidate Sanjay Nirupam, who lost with a big margin alleged EVM tampering as well. “Congress candidates have been defeated in Gujarat, Maharshtra and Uttar Pradesh with massive leads, which is not possible. The contract of the EVM had been given to a multi-national company based in Gujarat. This in itself is suspicious,” Nirupam alleged. Less ambiguous is the situation in Varanasi, which all media except Indian Express have studiously ignored. A day before the Varanasi polls, Awadesh Kumar Srivastava, a divisonal audit officer in the Rural Engineering Department, was given charge of two additional EVMs, to be used as replacements. 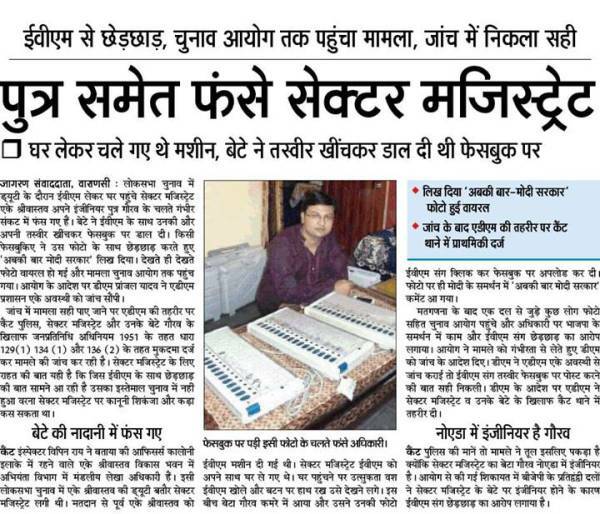 Srivastava took the EVMs home, instead of keeping them in the allotted sector headquarters as required. 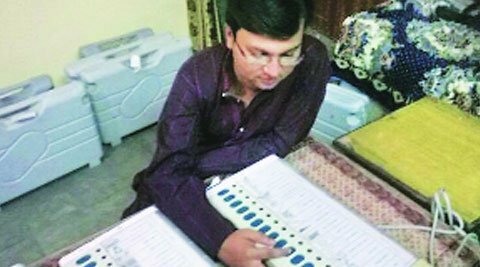 Srivastava’s son clicked photographs of himself and his father with the EVMs. He uploaded these photographs on Facebook, with the comment “Ab ki baar, Modi Sarkar”. And here is the kicker. A stray news clipping alleges that an Indian engineer from UK had been brought in to rig the Electronic Voting machines and ensure that BJP won 60 seats it was going to lose. This news needs to be traced, people identified and investigated, considering that there is already something strange with the UP Election Result. This, of course is in addition to the miraculous Modi wave that won all seats in UP except those seven seats from the Gandhi family and the Yadav family. 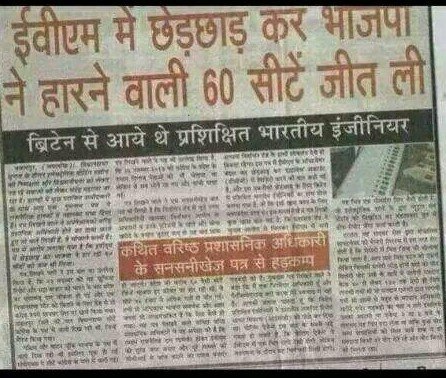 Engineer came to rig EVMs for 60 seats? I am currently trying to trace this newspaper. If you know please comment below. Better copy of print will also be appreciated. It can also be mischief, but the headlines are certainly serious enough to investigate. [update: It seems it may be a clipping from Amar Ujala. However, which edition and date is unclear. Still trying to confirm.] Kohram.in reports that election staff did bogus voting in favor of BJP casting 10 votes each for BJP and they apparently had a WhatsApp group to coordinate the same. Other issues include reports of booth capturing, presence of Rahul Gandhi in polling booth and accusations of EVM rigging and demands for re-polling by BJP as well. 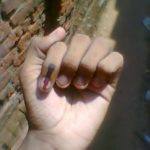 Considering the scale of Indian Elections and the significant number of situations where EVM fraud can be considered likely, this should be looked into by the Supreme Court and the Election set aside and re-election should be conducted using ballot paper in the interests of protecting the voice of the people if need be. 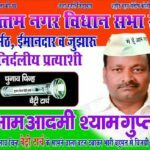 Update: Since then, BJP has also been accused of rigging EVMs in Civic polls in Maharashtra with some instances of more votes being counted than votes cast, allegations of tampering in the Pune Civic polls as well as in the Uttar Pradesh Assembly elections. Videos have also emerged of a woman alleging booth capturing in UP where women voters were told that the EVM wasn’t working, while their votes were cast in favor of BJP instead of BSP. The EC which could easily verify the paper trails and investigate complaints shows no inclination to do so. how about that the slots for elections are chosen by lot . An independent could have number 1 and a party could have number 7 all picked by lots on week before the election and then party put their seals. For each ward the lots should be drawn. the Indian is the most corrupt so we should plan fair and discrete means of elections. EVMs could have been tampered. A paper trail of voting should also be maintained. 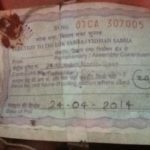 Vidyut please write on Medha Patkar EVM broken seal found on street too. EVMs rigging is possible? Some people says that in EVMs ‘they kept microprocessor and bluetooth radio’ by Dr. Alok Shukla,IAS,Deputy comissoner,Elcction Commisoner of India. The end of all the injustice will be a french type revolution in india. I had some hope that something could be done to bring back justice, but those were foolishly placed. You can not improve the system while living inside it. You have to go outside the system, take a big effing sludgehammer and smash the whole system itself. And then after destruction you have to falsefully hope for a better system – like sisyphus.